It’s been a while since I’ve posted anything on here, but as we’re well into 2012 now, I feel it’s only fair to update you on my Marathon Mission and my progress. December saw a last minute holiday to New York, which you might have thought along with a killer cold, would have slowed my training, but against all my better judgement I carried on regardless. I planned to have a nice restful week, but waking up at 5am every morning from jet lag, there was little to do other than abuse the free wifi and use the gym. One morning, I even searched New York Hash House Harriers, but sadly their runs cost $20 – a far cry from our £1 hash cash! Year I’ll have you know) I was back out plodding the streets with renewed vigour. 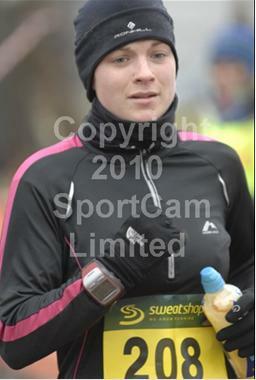 I ended 2011 in style with a 10km trail race, called the Gutbuster on New Year’s Eve. Well, there is no fun to eating and drinking too much if you haven’t been up at 6am for a sprint through the fords of rural Berkshire first! We ran round the course at a fairly stonking pace, I got my free mulled wine (and John’s) and went back to the car. Somewhat distracted by the flat tyre that I’d gained, I completely missed the prize giving. (Well it’s not something I normally need to bother with.) 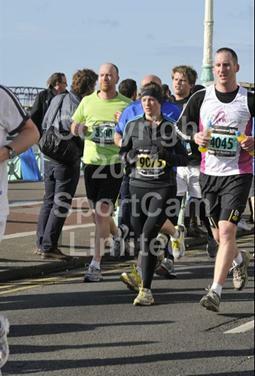 Anyway apparently I was the second ‘open lady’ (don’t, it’s not big or clever!) to finish, which gave me my first (and last) running prize! So now, the proud owner of a wooden plaque, I was spurred on to enter a glut of pre-marathon ‘warm up’ races. Well, it was either the wooden plaque or the numerous bottles of wine consumed later that day – it’s hard to tell! January was marked not by races or speed, but by the long slow plod of a Sunday morning. Finding someone else foolish enough to join me on my long runs was a great boost and suddenly I found myself running from Tadley to Basingstoke in an epic 19 mile run and I could still walk at the end of it! Feeling full of confidence that I’d finished January running two thirds of a marathon, I leapt into my races. high that when I lay down and pushed my feet against it, all that happened was that my bum lifted up! Kettle bells, weights and resistence work was all on the menu – a delight for an unfit runner like me! A short break for lunch and then the killer cardio started – an hour’s high energy spin class, which ended with the instructor driving us 6 miles from the gym and getting us to run back (on busy country lanes with no pavements!) When we got back, we had to do 80 lengths in the pool. The next day was slowed down a little by the snow, but we were driven out into the wilds of the moors (after getting stuck in the snow twice) and made to race the 10 miles home. The rest of the day was completed with kickboxing, more resistance work and circuits. All that and then the drive home to Wycombe. I know how to use my holiday! , a neck warmer, hat and two pairs of gloves is perfectly normal right? Racing round that in under an hour, we were over the moon and promptly celebrated with a fat Chinese takeaway. There has to be a perk of a Saturday evening race, right? Next up was the Bramley 20/10. Now there was a 20 mile option, which we could well have tackled, but discovering that you had to run the 10 mile course twice (including going back through the finish), we decided that would be far too demoralising. Forgetting that I had a race at the weekend, I trained hard all week, running or using the gym every night except Friday when we moved house and collapsed with exhaustion. Saturday saw a mini duathlon when I sprinted the 4 miles to the bike shop to collect my newly serviced bike and rode it home as fast as my legs would carry me. It was only when we were Bramley bound that I remembered everything I’d done in the week. That, combined with the cold weather made it a killer for me. It was only 10 miles, but we ran it as fast as we could, finishing in 1 hour and 19 minutes. (Well, 1.20 was the aim and I like to please!) But I think the pictures say it all! Have you ever seen such sad eyes? Struggling even from the third mile, I couldn’t get into a decent rhythm, but even with a decidedly ropey moment around mile 7, we finished in our target time. Finding a bakery on the way back to the car went a long way to making me feel a lot better about the whole thing mind you! It was just one week until Brighton Half Marathon, so with a bit of a cough working it’s way through, I did the sensible thing and rested up with just a 6 mile run on Thursday night. The difference was remarkable – I felt really fresh and ready to go on Sunday morning. (Although this could have been helped by the glorious weather, having got caught in the torrential rain and gale force winds the day before!) Leaving the calculations and timing entirely up to John, I just focused on running. Having no idea what time John had plugged into his watch, I assumed it would be pretty fast, so I set off at a good old pace, overtaking people who were getting in the way, thoroughly enjoying the flat road and spending my time looking for some of my colleagues running as well. There was some confusion when at mile 5, our watches seemed to be about half a mile different to the mile markers on the course, but presuming we would find a ‘short’ mile at the end, we carried on with gusto. At about 11 miles, I started to wane, which was only made worse when at 12 miles (or 12.5 miles on our watches), we were still nowhere near home. Even at 13 miles I couldn’t see the finish line and was feeling a little despondent. Again, thankfully there were plenty of photographers there to capture my pain. Finally, the finish line was in sight and we sprinted through. (Actually correction, John sprinted through. I stumbled through seconds later). Elated with our amazing time – 1.46, we stretched off and I couldn’t believe that I’d beaten my PB by a whole 12 minutes. But we were still confused by our watches. It’s normal for a race to be a little bit out – after all, we all run different lines, but 0.4 of a mile? It turns out we weren’t the only ones to complain and the following day, the organisers issued an apology and revised times. So what does that mean? Well, I am now officially the owner of a 1.43 half marathon time! That’s nearer to 1.30 than it is 2 hours. That might not mean anything to any of you, but I’m not a fast runner, so to come away with a semi respectable time is just amazing. So what next? Well, I plan an easy week or so, before celebrating my 25th birthday with a nice 22 mile plod. Other than that, I’m not sure. The marathon is getting closer – just 8 weeks away now, so I just need to stay fit, injury free and aim to smash my 4 hour target! In fundraising news, I’ve raised an amazing £678.40 (0r £779.25 with gift aid) for the Thames Valley Air Ambulance. Money incredibly well spent and proven this afternoon as they landed just metres from my office to rush someone to hospital. So if you haven’t sponsored me yet, check out this link www.virginmoneygiving.com/bryonyharper and see what you can give!